This site was created to provide information to footy fans that you can't get easily elsewhere, a home for North American fans of the sport, and a forum for discussion of Australian football (or "Aussie Rules") by fans of the sport. It is open to footy fans wherever they live and whatever their ages. Our goal is to provide for interaction between fans on footy in a civil and fun environment without "flames" or other obnoxious messages. We welcome questions about footy (who, what, where, why, how, rules, etc. ), television coverage, goings on in the sport, footy outside Australia, this web site, and more. If you want to talk curling, cooking, or soccer, you are in the wrong place. 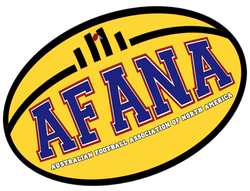 These Terms and Conditions constitute a legal agreement between the Australian Football Association of North America (“AFANA”) and you, the user of this site. Questions about this page may be directed to the site administrator. You are asked to keep the content of your posts consistent with "netiquette": e.g. respect for other people's copyright (don't post something from somewhere else without proper credit or prior written permission of the individuals or owner), no heated messages ("flames"), no personal abuse, make your subject lines relevant and informative about the content, use mixed case in your postings and registration information (ALL UPPER CASE LOOKS AS IF YOU'RE SHOUTING), etc. Posts or personal information with all upper case words in either the title or body (text) will be altered or deleted. Excessive use of punctuation such as long strings of exclamation marks (! ), question marks (? ), etc. will be removed. You agree that your posts will not be defamatory, vulgar, hateful, obscene, sexually oriented, threatening, or invasive of another person's privacy, contain adult material, or otherwise result in this site being in apparent violation of any law of the United States, Canada, or Australia. Spam, flooding, chain letters, illegal downloading links, or pyramid schemes, are also forbidden. The site administrator may remove or amend, without warning or notification, any material that may be considered abusive, libelous, offensive, significantly off-topic or otherwise disruptive of the purposes of this site. Advertising of products, services, or another web site is considered off-topic and will be removed. If you wish to advertise on this site, contact us as we have very reasonable terms. Links to other sites for informational purposes are permitted. "Spam" is absolutely prohibited and offenders will be banned from the site. Users are expected to treat others with respect and keep the discussion appropriate for a public forum for fans of all ages and types. This is a "family friendly" site and anything inconsistent with that may result in loss of privileges of use. Please limit your topics to Australian football, TV coverage, the sport here and in Australia, and related matters. Discussions of other sports and footy vs. soccer, etc. will be deleted. Harassment of anyone on the site will result in the offender being banned. Use of any words or language that could be interpreted to be offensive or sexual in nature may be removed without further notification or explanation. Anyone who feels that material posted on this site is objectionable is encouraged to notify the site administrator immediately. AFANA will investigate any such complaint however any action on our part will be depend on the results of that investigation. You, the user, are solely responsible for the content of your posted messages and content. Furthermore, you agree to indemnify and hold harmless AFANA, its sponsors and advertisers, any related websites, its staff, and its subsidiaries because of that posted content. AFANA reserves the right to reveal your identity (or any other related information collected on this service) in the event of any legal action arising from any situation caused by your use of this site. You, the user, agree to provide a valid e-mail address with which the administrators of this site may contact you, and to keep that address updated. If we determine the e-mail address is invalid, your registration may be deleted. You have the ability during registration to choose your user name. Your user name must be in mixed or lower case. If it is not, the site administrator will alter all upper case names. Your user name must not contain offensive terms or language or be inappropriate in a family environment. You agree not to give your password out to another person, for your protection and the security of your personal data and this site. You also agree not to use another person's account for any reason. We also highly recommend you use a complex and unique password for your account, to prevent account theft. Passwords are not available to the administrators of the site and if lost, will be reset to a temporary password. If you contribute to us, information concerning your e-mail address, type of payment, address, and other details may be disclosed to us by PayPal or other service providers we use. This information is not made available in any way on our web site and is stored on computers completely separate from those used to provide this website. You agree to this disclosure to us and to any other terms indicated by the service provider as well as applicable laws and regulations. We agree to safeguard that information. Redistribution of the content of this site is not allowed except by prior permission except for limited quotes for journalistic purposes only and with proper credit. You cannot forward material from this site other than links to a mailing list, BBS, or listserv without prior permission. You must ask our permission before re-posting the information herein on the web or distributing it via other means. Links back to this site or its content are permitted including links to our RSS feeds and via service links. You may link to articles on this site or the site itself without permission but please notify us as a courtesy; however links to or from sites that promote or conduct online gambling, sexual, or pornographic related material are never permitted. If you link to us and we determine your site is engaged in activity inconsistent with our purposes we may ask you to remove that link and you agree to do so. You may use the service links (to sites such as Facebook, Twitter, or Digg), RSS feeds, and podcasts on this site that are publicly available without further permission. You may use the "send to a friend" and "email this page" type links to send content to an individual known to you, however you may not use those links to send content to a mailing list, BBS, or listserv or to generate "spam" without our prior permission. The written content displayed on this website is owned by AFANA and may not be reproduced in whole, or in part, without the express written permission of AFANA except as noted herein. Any other use, in whole or in part, without prior permission, is prohibited. The trademarks, names, logos, and service marks (collectively “service marks”) displayed on this website are registered and unregistered trademarks and service marks of AFANA. Nothing contained on this website should be construed as granting any license or right to use any service mark without the prior written permission of AFANA or the owner of the service mark. Other service marks are the property of their respective owners and that use is acknowledged herein. You agree that AFANA’s entire liability, and your exclusive remedy, with respect to any service(s) provided under this Agreement and any breach of this Agreement is solely limited to the amount you paid for such service(s). Company shall not be liable for any direct, indirect, incidental, special or consequential damages resulting from the use or inability to use any of its services or for the cost of procurement of substitute services. AFANA reserves the right to revise these Terms and Conditions at any time. Any such revision will be binding and effective immediately upon posting of the revised Terms and Conditions on our web site. Your continued use of our site constitutes agreement to any revision of these Terms and Conditions. If you do not agree, please discontinue use of this site. If you under the age of 18, you must have your parents’ permission to use this site, and your parents’ consent to these Terms and Conditions upon your use of this site. These Terms and Conditions shall be governed in all respects by the laws of the United States of America and by the laws of the States of Ohio and Delaware. Each of the parties irrevocably consents to the exclusive personal jurisdiction of the federal and state courts located in Delaware or Ohio, as applicable, for any matter arising out of or relating to this Agreement, except that in actions seeking to enforce any order or any judgment of such federal or state courts located in Delaware and Ohio, such personal jurisdiction shall be nonexclusive. If you disclose personal information about yourself or another individual that post may be deleted and you could be banned from further use of the site. Our server logs your "IP address", i.e. the place on the web you are located. It is our practice to keep that information strictly private. However should it be necessary, it will be used to ban users who violate the policies of the site. Please be aware that this site is publicly accessible on the web and via some search engines. Any personal information included in a message may therefore be disclosed to other persons or entities. We value your privacy as we do our own. We do not disclose the personal information, e-mail addresses, or IP addresses of anyone who posts on this site to outside organizations or persons except upon receipt of a legally valid order from a court or for resolution of technical issues (such as to our web services partners). We do not conduct business in the European Union. However with respect to its privacy laws, any user, regardless of where situated, may request us to remove any personal information residing on this site or in our data files and we will do so. Such removal may result in the user's inability to interact with this site. As part of our data retention policy, we may delete accounts that have been inactive for more than two years and where the user has never engaged in any meaningful activity. Our privacy page is incorporated herein by reference and further explains this section. Copyright © 1997-2018, The Australian Football Association of North America. All rights reserved.